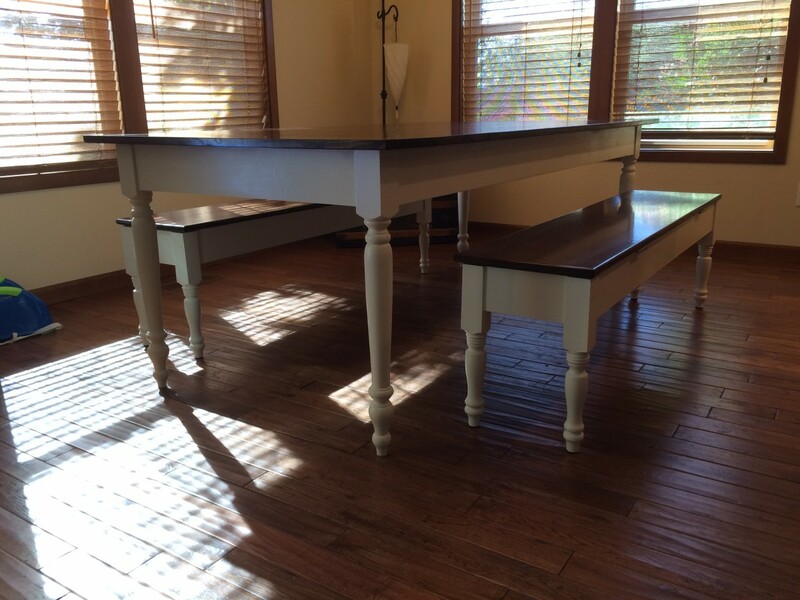 After I finished our kitchen table, I started on two benches: one for each long side of the table. At the last minute, my wife and I decided (a.k.a., my wife decided) to include some storage areas in the benches too. (And just like with the table, the source file is on GitHub.) Both the benches and the table are actually generated by the same code, so they literally are miniature versions of the table. I bought some 15″ pine legs from Home Depot, but I wanted an 18″ tall bench. What to do? Stretch the legs out, of course. I cut some blocks out of 3×3 poplar and glued them to the ends of the legs. After sanding, the transition is totally smooth. After paint, you won’t have a clue that these legs weren’t 17″ long. I cut mortises in the bench legs to accept the apron pieces. Not all of the legs received an accidental third mortise like this one. I cut tenons into the ends of the apron boards and added a groove to accept the panel that will act as the bottom of the storage area in each bench. The first dry-fit. Everything fit, and the legs all mostly touched the ground. I cut the panels to size and notched out the corners so that they’d fit around the legs. Each bench has two panels; I slid them in from the end before fitting the short sides of the apron onto the tenons. Glue-up time: I glued all the short sides separately. And the long sides plus stretcher. I did two coats of paint at this step so that I could avoid a lot of taping to not get paint all over the bottom panels. Remember what I said about how the legs would look after paint? You can’t tell that each leg has a block of poplar glued to it. I slid the panels in from each end and glue all of the mortise and tenon joints. This is immediately after removing the clamps. Enough about the bases, time to make the seats. I cut four pieces of 7″ 3/4″ red oak and joined them into two bench seats with biscuits. After sanding, I rounded the edges over with a trim router. I installed some wrap-around hinges on each bench to make accessing the storage as easy as possible. The hinges from the back. Subtle and refined. Benches and table, together at last. The benches fit underneath the table, exactly like a Transformer.